With the digital outofhome industry growing at an exponential rate, the demand for digital screens in different areas of the UK is on the rise. From SMEs to multinational brands, large format LED billboards provide an array of premium communication opportunities. Now, SIS’s pursuit to drive the digital revolution takes digital billboard signage to Cambridge, delivering the first of its kind in the city. 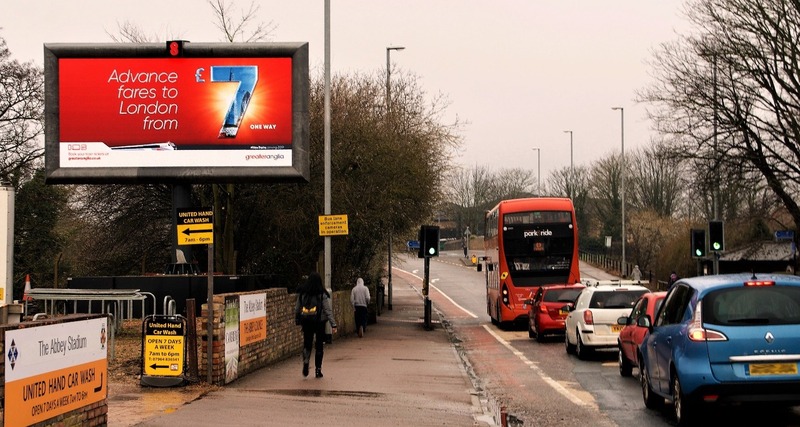 Located on the grounds of Cambridge United FC’s Abbey stadium, commuters and spectators will be drawn to the first and only DOOH large format screen in the city on behalf of client 8 Outdoor. The new screen brings the total of large format LED billboard delivered by SIS Digital to almost 100 and welcomes Cambridge into the family of UK locations SIS operate in, alongside Swindon, Warrington, Dundee, Manchester, Liverpool and London. For more information about our work in Cambridge and the surrounding area, please contact info@sisdigital.co.uk.